Midwich is pleased to announce it has entered into a binding agreement to acquire 80% of the share capital of Prase Engineering S.p.A, an Italian value-added distributor of AV products. Prase provides solutions for trade customers across all key verticals, including the corporate, retail, education and rental markets amongst others and has an unrivalled reputation in the Italian market. The business also operates its own training academy, offering customers bespoke AV training. The training is run by an in-house team, which operates out of the company’s Venice and Milan offices. The acquisition of Prase marks Midwich’s entry into Italy, a territory the group has identified as important in its international expansion. 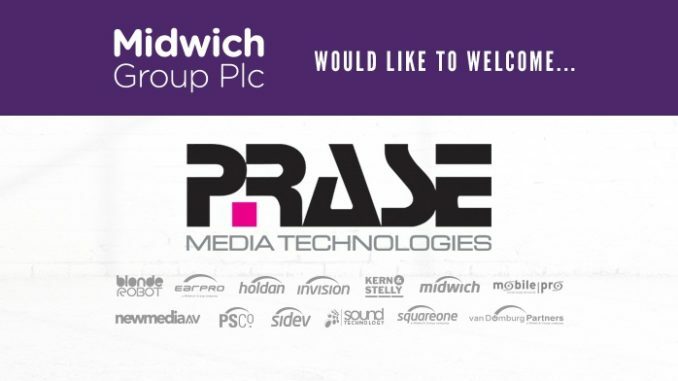 Stephen Fenby, MD at Midwich, said: “We are delighted to welcome Ennio, Alberto and the rest of the Prase team to the Midwich Group. The company has a very strong reputation, not only in Italy, but also in the European AV market as a whole. As the market leading professional audio distributor in Italy, Prase has an excellent portfolio of vendor partners and a broad customer base which it services with an extensive range of value add support. Ennio Prase, MD of Prase commented: “When we were approached by the Midwich team, we quickly saw the benefits of being a part of the group, and were particularly excited about joining a business with a focus on specialist, value-add distribution. Tom Sumner, European director of Midwich, added: “Prase’s expertise and reputation in the European market for outstanding levels of value add service make the business the ideal partner for the Midwich Group. It was clear from our first meeting with Ennio and Alberto that there was an excellent cultural fit between both organisations, with Prase sharing Midwich’s views on what makes a good value add distribution partner in the channel.